Minimalist interiors refer to a styling trend that focuses on reducing clutter in your home and only leaving the bare essentials. As you can imagine, the idea of a clutter-free home is deeply relaxing and this clean décor helps make the home a comfortable and clean place to escape to. Minimalism is less of a décor styling as it is a philosophy. You can go minimalist on many décor styles making it pretty versatile and easy to adapt to your tastes. 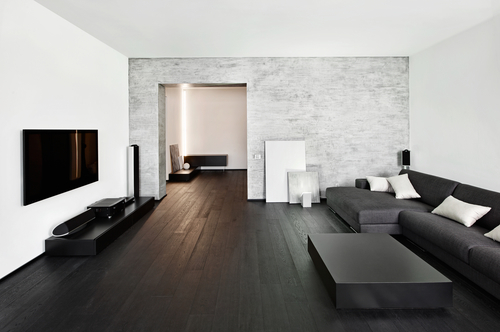 Whether you are working with a luxury home or a studio apartment, minimalism works in all spaces. Sounds interesting? Here are some pointers for you to keep in mind if you decide to go minimalist. The whole idea of minimalism is to strip the home to its bare essentials. This means that any frills or add-ons that are not absolutely needed are thrown out. Clearly, what passes as ‘bare essential’ will differ from person to person. For some, including at least one wall painting would be considered essential and there is nothing wrong with this. That is the beauty of minimalism. It can be adapted to fit your needs so you never have to do with something that you consider essential. When you go minimalist, try and use only neutral colors to enhance the look of your home. This means going with various shades of whites, creams or monochromatic black and whites. If you are so inclined, you can add a spot of color somewhere (with a painting for example) in order to not have the décor look too severe. Wood is also a great way to create some warmth as a contrast to the neutral colors. The essence of the minimalist design is the idea that less is more. This applies to the lighting as well where, as much as possible, you want to have maximum natural lighting. Natural lighting plays to your advantage in a minimalist design because the lack of clutter means that the light can reach into the furthest corners of the room. The implications here are to use large clear windows that let as much light as possible. If you don’t have the option of redesigning the windows, go for light sheer curtains instead of heavy drapes. When you are designing your interior, look for furniture that is versatile and whose design can withstand the test of time. Also, try a much as possible to find pieces that can double up as something else thus saving you the need to have two items. For example, your couch could be one of those that can be modified to serve as a bed. This way, if you are in a studio apartment, you do not have to have a couch and a bed but can change the function of either depending on the time of day. Textures are a great way to add some color to your minimalistic design. As we mentioned, it helps to break up the neutral tones with some color and textures such as rugs and cushions are a great way to do this. Try different colors and see what works with your décor. Following these tips will give you a great minimalistic décor that will make your home a peaceful and relaxing place. If you are looking to buy or sell luxury property in New Jersey, talk to NJLux, a leading luxury realtor in New Jersey. We have great listings and years of experience in the property market in New Jersey and you are assured of getting great value for your property.